There’s a rule in Maryland – when the fall season arrives you must visit a pumpkin patch. We are lucky to be able to fully embrace the season here with a variety of farms full of corn mazes and hayrides. A lot of pumpkin patches open by mid-September, but if you wait until mid-October, you might be able to keep your pumpkins ’til Halloween. 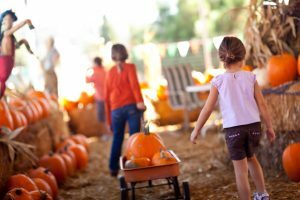 If you’re looking for a magical pumpkin picking experience, look no further than Clark’s Elioak Farm. This family favorite not only has an excellent pumpkin patch, but also a petting farm and … an enchanted forest. If you’re tired of the traditional hayride, here you can grab yourself a pony ride, an Enchanted Express train ride, or a ride on the Cow Train. Buppert’s might be a place you visit often for their fruits and vegetables, but they truly step their game up come pumpkin season. For weekends in October, you can hop on their hayrides to pick your own pumpkins. According to their website, the wagon leaves 11am-4pm on the hour. After you’ve picked your pumpkin of choice, don’t forget to check out their Indian corn, gourds, fresh pressed cider, and fall flower assortment. Jumbo’s is such an amazing spot to pick your own pumpkins. It has a 15-acre corn maze, hayrides, pony rides, and a petting zoo to boot. Of course, you also can’t visit without hitching a ride on their mini wagon. In the mood to shop for more than just a pumpkin? Jumbo’s also offers 3,000 square feet of fall shopping with tons of handmade items. This farm is chock full of activities including hayrides, a hillside slide, mini-tractor rides, duck races, a tire mountain, a maze, and more! Don’t forget to grab one of their famous apple cider donuts – a fall season must-have treat! While there isn’t an actual pumpkin patch, Weber’s offers plenty to choose from!